Thank you for visiting the Clermont County Mental Health & Recovery Board. Our website is designed to provide general information about the Board, links to the Board’s contract agencies in Clermont County providing prevention and treatment programs and services, and links to additional information about mental health and substance use disorders. 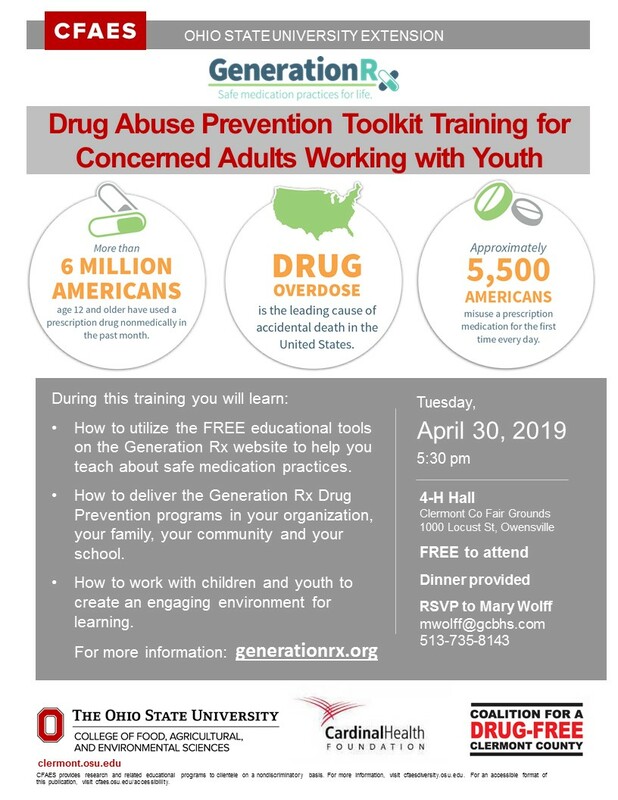 Join OSU Extension Clermont County and Coalition for a Drug-Free Clermont County for Generation Rx Drug Abuse Prevention Training. The event will be held Tuesday, April 30, beginning at 5:30pm at the Clermont County Fair Grounds. Admission is FREE and includes dinner, but reservations are required. RSVP to Mary Wolff at mwolff@gcbhs.com or 513-735-8143. The mission of Generation Rx is to educate people of all ages about the potential dangers of misusing prescription medications. In doing so, we strive to enhance medication safety among our youth, college students, other adults in our communities, and seniors. Prescription medications can help us live longer and healthier lives, but any medication has the potential to do harm – especially when misused. In a continuing effort to foster activities that promote positive mental health and prevent addiction, the Clermont County Mental Health and Recovery Board is pleased to announce that the opportunity for funding that we have labeled “mini-grants” will again be available for the upcoming year. The Board is looking for innovative projects that will positively affect mental health and/or prevent addiction for any age group. A total up to $40,000, from the Board’s levy funds, is available for programs serving Clermont County residents. The maximum funding per project is $4,000. The grant period is July 1, 2019 through June 30, 2020. Any organized group in Clermont County – with the exception of the contract agencies of the Mental Health and Recovery Board – can apply for funding. Previously funded applicants are eligible to reapply. Applicants must have a financial structure in place to account for the awarded funds. Funds may not be used to cover ongoing operating expenses. Proposals must be submitted no later than Wednesday, May 1, 2019, to: Mini-Grant Project, c/o Cindy Knoblauch, Clermont County Mental Health and Recovery Board, 2337 Clermont Center Drive, Batavia, OH 45103. Last year, the Clermont County Mental Health and Recovery Board funded a total of 17 mini-grants to 13 separate organizations. Nine schools in Clermont County received grants that assisted in initiating activities that helped children stay drug-free, established mentoring programs, or promoted mental health well-being. In addition, grants were awarded to other agencies providing services directed to community members, such as Safe Harbor of Hope and the YWCA. Any group receiving funding is required to submit a report to the Mental Health and Recovery Board on its efforts and resulting outcomes following completion of the activity. A final accounting of funds must be submitted within 60 days of the end of the activity. All unused funds must be returned to the Mental Health and Recovery Board. It is possible that mini-grants may not be available in the future or that a project funded once may not receive funds a second time, so mini-grants should be viewed as one time only funds. If you have any questions about applying for these grants, call the Clermont County Mental Health and Recovery Board at 732-5400. “We now know that we should’ve been more proactive in the very beginning. Back in 8th grade, my son’s teacher expressed concern. And another parent told me that Pat was using drugs,” says Barbara, who lost her son to an accidental fentanyl overdose when he was 46. “Finding quality treatment takes teamwork. I would recommend anyone who is going through this right now to find the resources in their towns. Connect with people and organizations that help families provide support to their loved ones and also support each other. Resources are much easier to find these days because people are finally talking about the disease. Organizations such as the Addiction Policy Forum have the tools you need readily available to you. This would have been so helpful when we were going through it with my brother,” says Katie, who lost her brother Zachary. Dr. Fuehrlein explains, “It is very clear that those suffering with mental illness have higher rates of substance use disorders and those with substance use disorders have higher rates of mental illness. PBS Newshour has started a new series titled, “America Addicted” that explores every aspect of the opioid crisis in detail. The four-part series contains multiple eyewitness accounts and expert testimonies on the causes, results and treatment of opioid use, and the impact of race on the public’s reaction to the crisis. Read the entire series here. Do you or a loved one need help with an addiction? Do you or a loved one need recovery support or assistance in navigating through the various treatment resources in and around our county? Are you new in your recovery and feel that you would benefit from some on-going recovery support? There’s a collaborative effort among local grass root groups to help with the growing and overwhelming Heroin Epidemic in our county. The Hope Center in Amelia opened Friday, September 16th, 2016 as a community resource center to assist individuals and their family members who seek recovery from the disease of addiction. In the beginning the Hope Center will be open from 10:00-12:00 on Fridays on a limited basis and will increase hours and days based on the demand. Claudia (LightShine Addiction Services) @ 513-512-7007. The National Alliance on Mental Illness (NAMI) has released a helpful infographic designed to help individuals take charge of their mental health and wellness. NAMI has created this infographic to highlight topics an individual should think about as they begin on the path to mental wellness. The infographic provides individuals with information on finding the right specialist, making the first appointment, asking questions to specialists, and how to stay involved in maintaining wellness. To see the infographic, click here. Click here to get information on various mental health disorders. Mark your calendars as you will not want to miss any of these events! Don’t forget to check out our “Calendar” page to see what we’ve got scheduled! Our Board of Directors meets on the second Monday of each month at 7:00 p.m.
Community members are more than welcome to attend! The Opiate Task Force meets on the second Thursday of each month at 2:00 p.m. The meetings are now being held at the Sheriff’s Office at 4470 OH-222, Batavia, OH 45103. Community members are more than welcome to attend! Hope to see you there!